“Never Alone” (translated from “Kisima Inŋitchuŋa” in the native language of the Northern Alaska Tribes) is a 2014 collaborative effort between Upper One Games and the native peoples of Northern Alaska, collectively called ‘Inupiak’ (a subculture of the more widely known Inuit) to share their culture with the wider world via the new medium of videogames. Lead by Inupiak historian and writer, Ishmael Hope, the project strove to blend education and entertainment in order to shed light on this little-known tribe, even as their way of life teeters on the brink due to the effects of climate change on their tribal lands. The result is an interesting documentary on the Inupiak people, with a beautiful but underwhelming game attached. “Never Alone” employs 2 distinct art styles. During cutscenes, the imagery is entirely 2D and features a simple pictographic style inspired by the scrimshaw carvings and picture writing of the Inupiak. During the actual game, though, the visuals are thoroughly modern polygons with an excellent sense of design and artistic quality. The characters look amazing and are beautifully animated, especially when one considers that “Never Alone” is a Unity Engine game. However, some aspects of the game’s setting in Northern Alaska can get in the way of gameplay. Most of the environments are various shades of white and gray, which can make it difficult to tell what’s in the background versus what’s in the foreground. Likewise, the camera tends to be rather claustrophobic, making it impossible to get a bigger-picture view of the player’s surroundings. 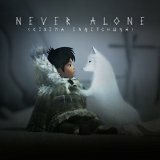 The soundtrack in “Never Alone” is adequate, but for the most part, the only time I noticed it was during the end credits, which are beautifully accompanied. For the vast majority of the game, the most dominant sound one will hear is wind. “Never Alone” is also noteworthy in that it’s narration is fully voiced in the Inupiak language by a native speaker, which adds a ton of authentic character to the experience. Technically, “Never Alone” is sound. It never crashed on me, supports Xinput out of the box, and the most annoying error I ran into was the fact that some of the documentary videos had trouble starting, and would just kick me back to the previous menu a few times before playing properly. “Never Alone” and its prequel DLC, ‘Foxtales,’ relate some of the more iconic stories from Inupiak oral tradition. These tales originally featured male protagonists (as one can see with the clash between the story presented and the transcriptions that appear on the loading screens), but for one reason or another, in “Never Alone” the protagonist is an Inupiak girl named Nuna who befriends an Arctic Fox named… Fox. In the base game, these two companions set out on a fairly typical Hero’s Journey story arc, endeavoring to discover the source of an unrelenting blizzard. In the process, they encounter a number of iconic characters and archetypes right out of Inupiak mythology. Foxtales takes place before the base game (and obviously wasn’t about the same characters in its original form). It relates an unrelated tale about two brothers who live along a river and who must defeat a giant mouse (?!) that has taken up residence in the riverbank. Foxtales is the type of myth present in every culture that strives to provide understanding and give meaning to unique physical locations – in this case, a collapsed section of the riverbank. Any student of mythology and cultural history can easily see the value in preserving these traditional stories. It’s also noteworthy just how similar the heroic archetypes are across nearly every human culture. On the other hand, with the Inupiaks’ constant focus on survival and simple way of life, anyone expecting a deep narrative with plot twists at every corner will come away from “Never Alone” and its DLC disappointed. The base experience for “Never Alone” is also shockingly short. The entire game lasts a scant 2 hours. Foxtales is even shorter, clocking in at roughly 1 hour. Padding out this short run-time are 45 minutes’ worth of documentary style videos, featuring interviews with a number of Inupiak people. These interviews are all rather short, but each ties-into the narrative presented in the game, providing background and context. “Never Alone” is a fairly simple 2D Platformer that just doesn’t live up to the genre’s current standards. Its sole novelty is the fact that the game is designed from the ground-up to be a cooperative 2-player experience that just happens to have a single-player mode slapped-on. Throughout “Never Alone,” the player(s) take control of both Nuna and Fox. Nuna, as a human, runs more slowly across the snowy ground, but can manipulate a variety of objects, including a throw-able bola, carry-able rocks, push-able cages, and a canoe. Fox, as a fox, is more adapted to the arctic environment and in-tune with the spirit world, allowing him to move quickly, wall-jump, and interact with spirits and the objects they possess. Except for the fact that the controls are incredibly sloppy and the puzzles are never particularly interesting. I’m going to lay the blame for the game’s poor controls at the feet of the Unity Engine, as the imprecise character movements and sometimes unpredictable interactions with pieces of the environment have the same floaty, loose feel as other Unity games. The puzzle design, though, is purely a problem for the developers, as the game is inconsistent in how it treats environmental hazards. Sometimes water is instantly deadly, other times Nuna and Fox can/must swim around in it to proceed. Fox’s movement when manipulating spirits is incredibly sluggish, yet sometimes requires fast, precise movement during auto-scrolling sections. The companion AI when playing solo isn’t particularly great either. While the non-controlled character will typically strive to follow the controlled character while still remaining safe, there were several times when my AI companion just committed suicide by running into an obstacle or jumping into a pit. “Never Alone” is an interesting and well-produced documentary on Native Alaskan Inupiak culture with a mediocre 2D Platformer bolted onto it. The game’s short length is both its best friend and worst enemy, as it prevents the sloppy controls and uninteresting puzzles from grating, yet never really allows the puzzle design a chance to take-off. As an Edutainment title that aims to spread knowledge about a nearly-extinct indigenous culture, “Never Alone” is a lovely idea, but I think a documentary on PBS would have been more effective and reached a far larger audience than a digital Indie game.